Worldwide Marriage Encounter® traces its roots to Spain. In 1952, Fr. Gabriel Calvo began developing the Encuentro Conjugal to help couples live their vocations more joyfully. This retreat was later taken to Latin America, and in 1967 it reached the United States during a presentation at a Christian Family Movement Conference held at the University of Notre Dame. Couples and priests who attended from the New York area were inspired to use this experience as a foundation for spiritual renewal in the Church. Fr. Chuck Gallagher, S.J. was among those who contributed to the evolution of what is now known as the Worldwide Marriage Encounter® Weekend. Within three years, a new Movement in the spirit of unity of Vatican II was born. It has since spread to nearly 100 countries around the world in six continents: Africa, Asia, Europe, Latin America, North America, Pacific. Over 1,600,000 couples and 24,000 priest and religious have experienced the Weekend. The Weekend is presented in 11 different faith expressions: Roman Catholic, Baptist, Episcopal, Lutheran, Mennonite-Brethren, Pan Orthodox, Reformed, Seventh Day Adventists, United Church of Christ, United Methodist, and Wesleyan. Worldwide Marriage Encounter promotes open, honest, tender and trusting relationships between a husband and a wife, between priests, religious and their communities, and the relationship of everybody with God. Worldwide Marriage Encounter is run entirely by missionaries: couples and priests who respond to the call, by offering freely of their service. Through living the concepts of the foundational experience, their sacraments come alive. Couples are empowered to become evangelizers by witnessing to God’s love. Priests and religious are called into a greater communion with their people; they see they are not alone in carrying out the mission of the church. The community that emerges is a real experience of Church. This entire worldwide movement is funded by the free-will donations given by generous couples during the Weekend. Over the years, as costs have risen and economic conditions have deteriorated, the need for an endowment fund has become a necessity. It seemed fitting to name this endowment after Fr. Chuck Gallgaher, S.J. following his death in August 2013. 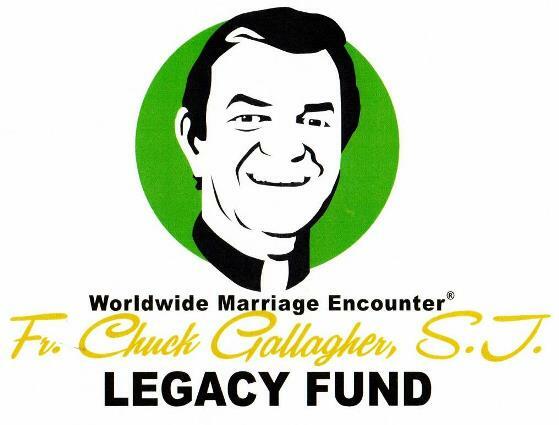 Proceeds from the Gallagher Legacy Fund will be used to train the missionaries to provide the best possible Weekend experiences to provide Leadership training. "I place much of my hope for the future in Worldwide Marriage Encounter." "Marriage Encounter, yes, you do so much good in the world." "I am familiar with Worldwide Marriage Encounter, and the good work that you do."